"Unparalleled protection for your staff and premises"
"The speed of response can make the difference between preventing a crime from happening or being a victim of it." Challenge Alarm Services is a family run business located in North Devon. Established in 1991, the business covers the South West region of England and has a wealth of experience in all aspects of Fire Alarm, Intruder Alarm, Nursecall, CCTV, Access Control and Emergency Lighting systems for both domestic and commercial properties. We are committed to providing our customers with a first class friendly service. Challenge Alarm Services have been approved installers of the “Security Systems and Alarms Inspection Board” (SSAIB) since 2003 and were the first company in North Devon to achieve all four modules of the BAFE SP203 standard; designing, commissioning, installation and servicing of fire alarm systems. This accreditation, achieved in 2008, is only awarded to companies, which demonstrate the most rigorous and professional working practices. 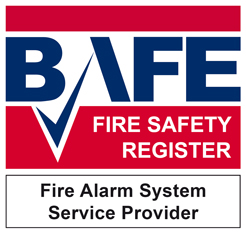 Due to recent changes in legislation BAFE SP203 will soon become an industry standard for all fire alarm companies. Challenge Alarm Services Ltd has built up a strong and loyal customer base in both domestic and commercial sectors, looking after a wide range of establishments from National Stores and Hotel Chains, Hospitals, Schools, Nursing Homes and Industrial Premises. For expert advice, where quality and value matter, contact us now for a quotation, you will be in safe hands.